In her coastal farming village in eastern India, Dibyashree Behara knew that getting sick meant visiting a local healer or traditional medicine practitioner. “In my village, there is no doctor. One has to walk many miles before they can show themselves to a doctor or a nurse,” she said. 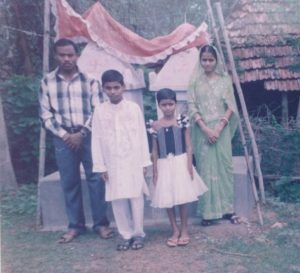 It was the dream of a young girl, the daughter of a farmer and homemaker, neither of whom ever had a chance to finish school. But Dibyashree’s parents wished for her and their two other children what they could not achieve themselves—an education and a profession. Dibyashree’s family supported her ambition to be a nurse. An uncle encouraged her to realize her dream. At 18, with his support, Dibyashree applied to a nursing school some 250 miles away from her remote village in the coastal state of Odisha, sending her application from a computer in a small shop in her village. Dibyashree stands before an icon of global nursing. For a teenager with limited means, the online application process eliminated several hurdles to achieving her dream. “Every student doesn’t have great economic power to undertake the cost of travelling again and again. The online admission process saved a lot of trouble for me and my family,” said Dibyashree. Young girls face immense barriers in achieving their dreams, starting with lack of basic education and health care. Sixty-two million girls around the world are not in school. These girls have diminished economic opportunities and are more vulnerable to HIV/AIDS, early and forced marriage, and domestic violence. When girls are educated, they have better control over their future and can lift up their families and transform their communities. A World Bank study found that every year of secondary school education is correlated with an 18% increase in a girl’s future earning power. After a few more steps and a trip to a processing center at the school, Dibyashree was admitted to the nursing school in Brahmapur. 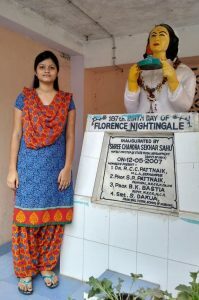 She is one of more than 6,700 students who gained admission to general nursing schools through an online process developed for the government of Odisha with technical assistance from Jhpiego. More than 50,000 students applied online, a milestone in the state’s efforts to expand educational opportunities for girls. Increasing the ability of young women to become nurses will help reduce the gap in frontline health workers in India and elsewhere. The World Health Organization estimates a shortage of at least 17 million health workers worldwide, including at least 9 million nurses and midwives. Dibyashree with her fellow nursing students. Over the past four decades, Jhpiego has helped educate, train or mentor hundreds of thousands of frontline health workers to deliver lifesaving care to women and their families. Dibyashree represents the potential of each and every girl throughout the world. We believe that where women live should not limit their worth, value or ability to live up to their full potential. It should not limit their access to basic health care and education. By educating girls, we empower them to fulfill their dreams and increase women’s participation in the health workforce so they can advance economically and socially—and prevent the needless deaths of women and families. Indrani Kashyap is a senior communications officer in Jhpiego’s India office. Colleagues Rashmi Kochuveetil and Manaswini Biswal contributed reporting and photography to this story. This article was initially posted on https://www.frontlinehealthworkers.org/.